The Church of St John the Baptist is situated on a hill beyond the village and is worth to visit. On the arrival of the monsoon, Feast of St John the Baptist (Sao Joao) is celebrated as a thanksgiving. A Sleepy Village Only a decade ago, this fishing and rice-farming village, scattered around the coconut groves and paddy fields between the main Colva-Mobor Road and the dunes, had barely made it onto the backpackers map. Now, the shady lane leading through it is studded with guesthouses and souvenir stalls while the paddy fields on the outskirts are gradually disappearing under a rash of gigantic luxury resorts and time-share apartment blocks. For the time being, however, this remains a peaceful and welcoming place to unwind. Either side of the sand blown beachfront, the gently shelving sands shimmer away almost to the horizon, litered with photogenic wooden fishing boats that provide welcome shade if the walk from the palm trees to the sea gets too much. Hawkers, itinerant masseurs and fruit wallahs appear from time to time, but one can easily escape them by heading south towards neighbouring Varca, where tourism has thus far made little impact. Moreover, the sea is safe for swimming, being generally jellyfish-free, while the village itself boasts a few serviceable bars and restaurants, several telephone booths and a couple of stores. Benaulim's proximity to Margao market, along with the presence of its Christian Fishing Community, means its restaurants serve the most succulent, competitively priced seafood in Goa. The most popular places to eat are the shack cafes in the beachfront area, where Johncy's catches most of the passing custom. However, one'll find better food at lower prices in the smaller terrace restaurants further along the beach and scattered around the village. Arguably the best of bunch is the Palm Grove's Congenial Garden Restaurant, and there is a string of lookalike caf�-bars, which dot the lane leading to it. For fresh seafood, though, the Hawaii Shack is hard to beat. 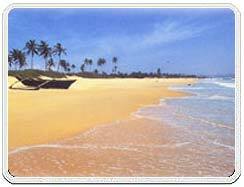 Air : The Dabolim airport is 29 kms away from Panaji and 70 kms from Benaulim. Rail : The nearest Railway station is at Karmali, 11 kms from Panaji and Panaji is 40 kms from 41 kms. Road : Buses can be taken from Colva and Margao. 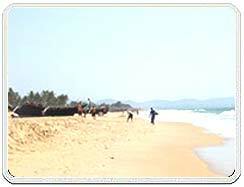 The Bull Fights From early October to late May, from 4 pm onwards, one can enjoy bull fights at Benaulim. With the Konkani music playing, the bullfights are usually take place in an old rice field with no fences or barricades just outside the village. Ranged around this busy junction are two well stocked general stores, a couple of caf� bars, a bank, pharmacy, laundry and the taxi and auto rickshaw rank, from where one can pick up transport to the beach 2-km west. Signs offering bicycles and motorbikes for rent are dotted along the lane leading to the sea rates are standard, descending in proportion to the length of time one keeps the vehicle. The nearest place to change money is one of the banks in Margao. Benaulim's Bank Of Baroda only handles visa card encashments; the L'Amour Beach Resort also has a Foreign Exchange Counter for guests. Benaulim does not have many options as far as accommodation is concerned. 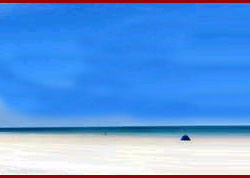 But the nearby Colva beach has a lot resorts and low budget hotels.